Drum circles are activities and events. They are open to people dropping in without any equipment and without much training. 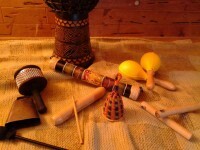 Usually, they are based around playing African and middle-eastern sorts of hand drums. However, the most important thing to bring to a drum circle is openness to learn. Also, the desire to bang something with some kind of rhythm is a prerequisite. After that, the spirit of welcoming acceptance ubiquitous to drum circles guarantees a comfortable experience for participants.